evertheless, the study, published in the Japanese Journal of Cancer Research, concluded that BHA was “reasonably anticipated to be a carcinogen,” and as far as I’m concerned, that’s reason enough to eliminate it from your diet. I’ve harped on this before, but it bears repeating: Don’t confuse “0 g trans fat” with being trans fat-free. The FDA allows products to claim zero grams of trans fat as long as they have less than half a gram per serving. That means they can have 0.49 grams per serving and still be labeled a no-trans-fat food. Considering that two grams is the absolute most you ought to consume in a day, those fractions can quickly add up. The telltale sign that your snack is soiled with the stuff? 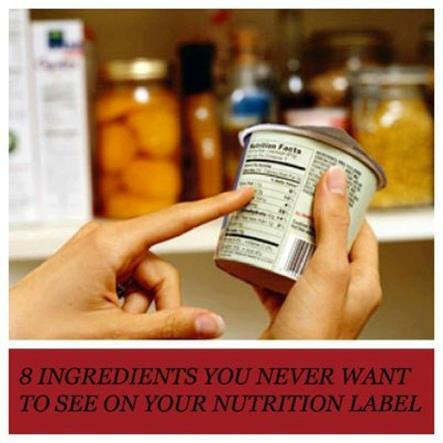 Look for partially hydrogenated oil on the ingredient statement. If it’s anywhere on there, then you’re ingesting artery-clogging trans fat. Plenty of fruit-flavored candies and sugary cereals don’t contain a single gram of produce, but instead rely on artificial dyes and flavorings to suggest a relationship with nature. Not only do these dyes allow manufacturers to mask the drab colors of heavily processed foods, but certain hues have been linked to more serious ailments. A Journal of Pediatrics study linked Yellow 5 to hyperactivity in children, Canadian researchers found Yellow 6 and Red 40 to be contaminated with known carcinogens, and Red 3 is known to cause tumors. The bottom line? Avoid artificial dyes as much as possible.